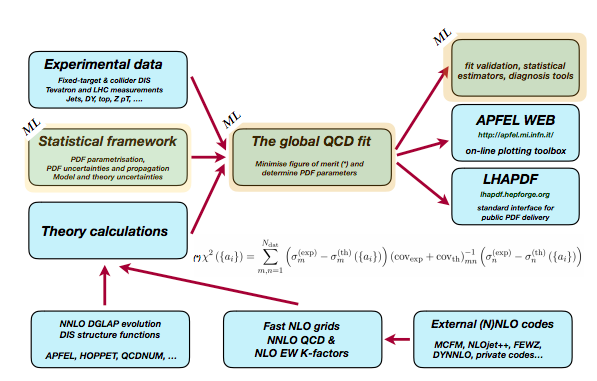 The NNPDF approach to global QCD analyses has been successfully applied to the determination of unpolarised and polarised parton distributions of the proton as well as to the light-hadron identified and the unidentified fragmentation functions (FFs). The latter are the time-like counterparts of the PDFs, and describe the hadronisation process of colored partons into color neutral-hadrons. There is also work in progress towards NNPDF fits of nuclear modification factors, relevant for the interpretation of heavy-ion collisions at RHIC and the LHC. In the figure above we indicate the different components that constitute the NNPDF family of global analyses, highlighting those that involve machine learning algorithms. As illustrated there, a global QCD fit is based on three main inputs: experimental data, higher-order perturbative calculations in both QCD and QED/electroweak theory, and a statistical framework dealing with aspects such as the PDF parametrisation and their uncertainty estimate and propagation. These three ingredients are combined in the global QCD fit by means of the minimisation of a suitably defined figure of merit, the , which includes all relevant sources of uncertainty and which leads to the determination of the parameters that define the PDF shape. Experimental uncertainties are propagated to the PDFs by means of the Monte Carlo replica method, which allows constructing a representation of the probability density in the space of PDFs. Afterwards, the fit is validated using a range of complementary diagnosis tools and it can be plotted in different ways. Finally, the PDF fit is translated into the LHAPDF standard interface, suitable for its public delivery and its integration into other HEP codes and into the analysis framework of the LHC experiments. Machine learnings tools arise in various components of the NNPDF framework, including the strategy for the PDF parametrisation, the optimisation (training) that defines the best-fit parameters, and the subsequent validation by means of closure testing.